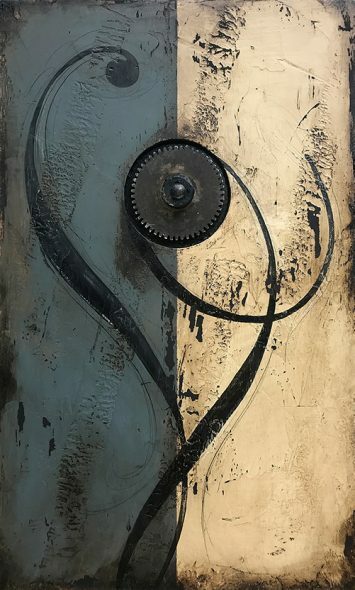 Easton, PA, August 1, 2018: Domenick Naccarato, Lehigh Valley artist, shares his love of found objects through sixteen new works of art in his show, ‘Ode to the Object,’ on display at Connexions Gallery in Easton, PA from Aug. 24 through Sept. 30. Carrying on the traditions of early 20th century, found object artists, Naccarato attempts to redefine the purpose and beauty of seemingly mundane objects in each of his creations. Items like pulleys, gears, and railroad spikes, are carefully incorporated into compositions that dignify the items in a way that goes beyond their intended use. Each piece uniquely celebrates the object(s) and invites the viewer to share in the honoring of what is commonly overlooked scraps of metal. Naccarato’s use of found objects has been a long running theme in his work. Never quite satisfied with painting alone, he often blends these assemblage elements with the otherwise flat surfaces to create what he calls his 3-dimensional, “sculptural paintings.” Though the focus is always centered around the objects, he makes an effort to surround them with colors, textures, and composition that compliment them. In some of the pieces, he embellishes the item with swashes, a typographic flourish typically found on ornate typefaces. In conjunction with the Fall seasonal group show at Connexions, an opening reception is scheduled for Saturday, Aug. 25, from 7-10pm. The gallery is located at 213 Northampton St, Easton, Pennsylvania 18042.